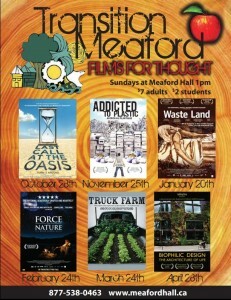 Four tweens sat in the front row of Addicted to Plastic; the film that was on screen at Meaford Hall, Grey Cup Sunday. The movie was a well presented documentary on the global environmental damage of plastic. It went well beyond our common knowledge that plastic isn’t biodegradable and therefore lasts forever. Professor Frederick vom Saal, a biologist at the University of Missouri says that in parts per trillion a certain chemical that is in plastic can disrupt the exquisitely sensitive gift that is life. This disruption leaves us and other mammals with reduced potential to procreate and increased potential for breast or prostate cancer. It was no Disney movie. The film Free Willy seems benign in comparison to the plight of plankton eating fish and whales. While feeding, they eat massively more little balls of plastic than plankton, their source of food and life. How do parents talk to their kids after a film like this? How do they explain that so much damaging environmental degradation goes on because of greed and convenience? 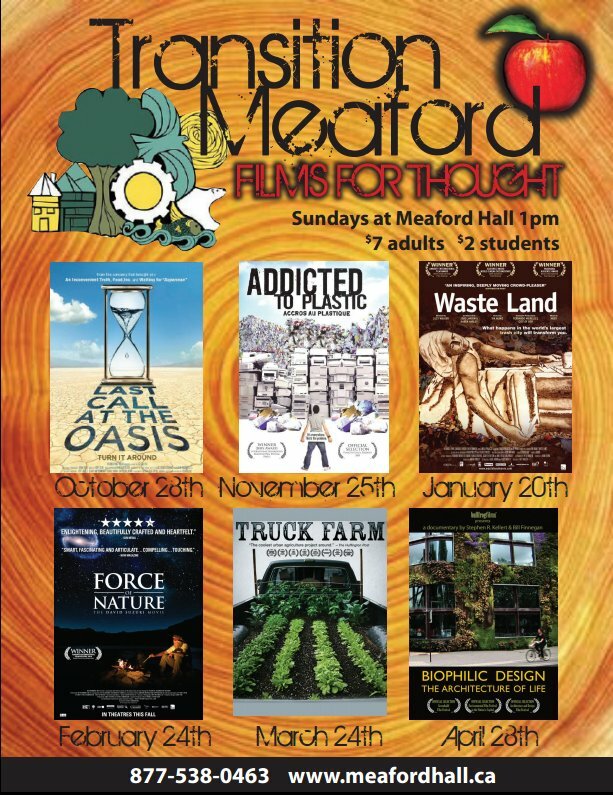 The purpose of the Film for Thought series presented by Transition Meaford isn’t to give children nightmares or paralyze adults. The goal is to spark collective action that will remove road blocks to a healthier community and planet. The film documented other people and communities around the globe taking action. Arising out of the ‘open mike’ session at the end of the film was the suggestion to create a plastic film collection & recycling pilot project. Several movie goers stepped up to be part of an ad hoc team to move this idea forward. Watch for future invitations to participate. If we all do our part maybe when the children of these tweens go to the movies they won’t have to watch a horror show! There has been some interest in reviving the Green Drinks get-togethers.